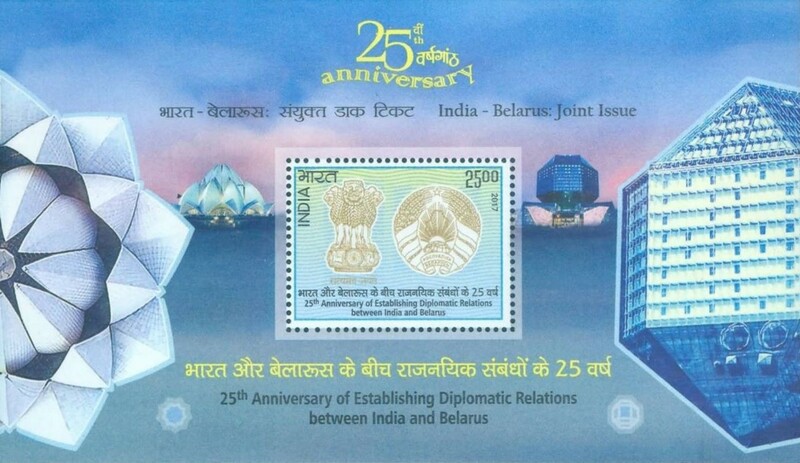 Belarus and India issued a joint stamp on 12th September 2017 to celebrate 25 years of diplomatic relations. After the former Soviet Union was re-organized into several independent countries in 1991, India established diplomatic relations with the 15 new countries over the next couple of years. So, the 25th year of establishing these relations were celebrated in 2016-2017, including the joint stamp with Belarus i 2017 and a belated one with Armenia in late 2018 (see here). 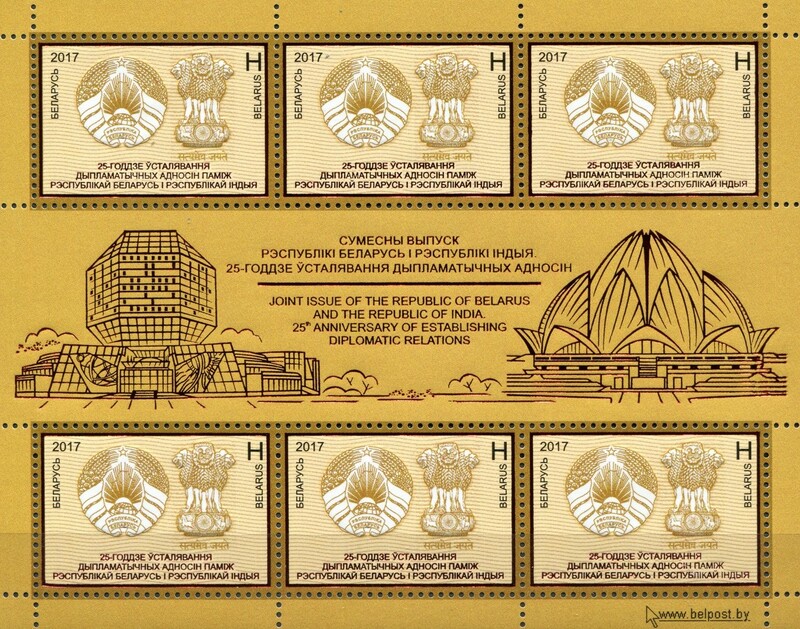 These two issues along with the one with Russia in 2017 (see here), are the three joint stamp issues with former Soviet republics that have so far been commemorated with India. The theme for the joint stamp with Belarus was quite simple: National Symbols. Belarus has been issuing similar stamps with a host of other nations over the last few years, some joint and some unilaterally. Many recent stamps from Belarus just show national emblems from two countries and not much else. Belarus national emblem has several elements including an outline map of Belarus, partial globe showing Eurasia, partial sun emanating golden sun rays, stalks of wheat adorned by flax flowers and clovers. Remainder of the symbol is wrapped with red and green ribbons and official name of Belarus is inscribed at the bottom. On the other hand, India's national emblem is quite simple. It contains a two dimensional adaptation of the Ashokan Lion Capital from Sarnath. The original sculpture shows four lions facing in four directions, symbolizing courage, power, confidence and pride. This resides on a circular base, which shows the Ashokan Dharma Chakra (wheel) and several animals including a horse, bull, elephant and lion. This entire sculpture is placed on a blooming lotus. The official symbol is a 2D adaptation shows a few limited features. A motto meaning Truth Alone Triumphs from the Hindu Upanishads is inscribed under the lion capital emblem. Given Belarus Post Office has been using the same stamp format showing national symbols for the last few years, it's safe to assume Belarus designed the stamp and India Post used the same design. 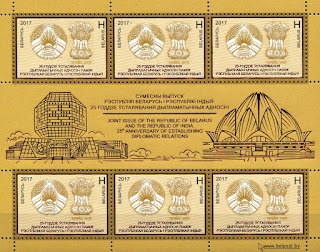 India Post issued the stamp in individual sheet of 45 stamps (Rupees 25 denomination) along with a miniature sheet containing one stamp. Kamleshwar Singh deigned the miniature sheet that shows the Lotus Temple in New Delhi and the National Library in Minsk. Belarus version of the stamp was issued in sheetlets of 6 stamps, with an element of embossing and red hot foil showing the National Library and Lotus Temple in the selvage. Belarus stamp was issued as minimum postage for international mail in 60,000 copies. India Post issued a total of 0.5 million stamps in individual sheets and 0.1 million souvenir sheets. 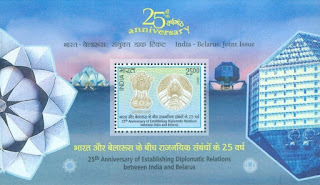 The stamps were dedicated at a ceremony in New Delhi when the President of Belarus was visiting India for an official visit. Please give due credit to BetterPhilately when sharing details with other collectors. Simple theme. Powered by Blogger.